From a London invaded by Axis forces to pre-Mayan ruins in the Amazon jungle, millennia-old secrets of the Dust universe await in all corners of the Earth. Embark on a whirlwind campaign that pits an elite Allied team against ah Axis, SSU, remnant Nazis, and a secretive cult in a race for the legendary Seven Seals. A globe-trotting story that will take you to such places as South America, Turkey, Thailand, and the Philippines. The introduction of a new alien species fighting the Vrill, as well as the secret history of their intergalactic war. All-new information on the three blocs. Epic action set-pieces, including a battle aboard a top secret Axis aircraft carrier. 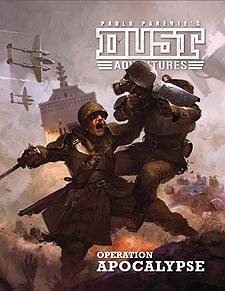 Dust Tactics and Dust Warfare scenarios for the large-scale battles of the campaign. Expansive and deep, Operation: Apocalypse will satisfy fans old and new alike. For use with the Dust Adventures roleplaying game.